National Institute for Health and Care Excellence (NICE) is ruling doubles to 1.8 million the numbers qualifying for tax-payer funded surgery. 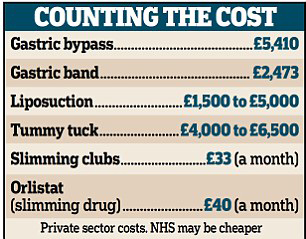 NICE offers weight loss surgery to a million diabetes patients while the campaigners said it is wrong to offer operations costing £5,000 when National Health Service (NHS) faces a £30billion shortfall and NICE is refuting cancer patients’ life-extending drugs. The campaigners warn the obese that they should exercise more and eat less. Thousands of people may fall into the set category and they may demand for the surgery; we should end up with the situations where the life saving drugs can be used for and save the people from expensive bariatric surgery. The people are still need to have healthy food and exercise on regular basis.